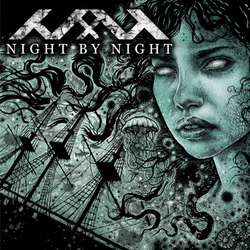 Night By Night are a young hard-rocking band from the UK cited as a solid take on 80's hard rock n roll ala Def Leppard among others. Featuring Sisters Of Mercy guitarist Ben Christo in their ranks I was intrigued and gave this disc a couple of spins. I may focus primarily on traditional, power and thrash metal, but my roots are in the dirty, sleazy and hard rocking 80's having cut my teeth on the Crue and Ratt among others before getting into the heavier side of the metal spectrum so I have a soft spot for bands that are trying to re-invoke the party hard, glam spectrum of rock and metal. With a triple shot of Time To Escape, Holding Onto Holding On and Can't Walk Away to lead the charge, I see the booze-laden rock swagger a plenty on this disc with vocal lines and guitar parts playing up to the image and sound perfectly. Production is shiny and well-done and I thought for sure that this was going to be a sizzler of an album. Everywhere Tonight came on and left me a bit flat to be honest, being the traditional ballad to be expected on this type of album, but even as far as ballads go it was a bit boring. Siren and A Thousand Lies helped to redeem the album from that point on, but after that the sound got a bit tired and started to flatten out, cutting down on the replay value of the album. Some decent moments in there but this is largely a very front heavy album with a weaker B side as the energy just sorts to evaporate. Still for the first side of the album alone it is well worth checking out!